With the British weather being so unpredictable, Toggi knows that long-sleeve t-shirts, sweatshirts and knitwear are must have items for all year round, with the secret to staying warm lying in multiple layers. With this in mind, its 2003 Autumn/Winter collection has been extended to include some innovative knitwear to keep you warm and looking good, plus some additions to its long sleeve t-shirt range and sweatshirt range. New to the range and crossing the bridge between t-shirt and sweatshirt, the Franklin is a 100 % cotton pique shirt with twill trim, button placket and contrast embroidery. Priced at £29.99, the Franklin is available in contrasting colourways of navy/denim, aubergine/grape and sweetpea/raspberry, in sizes 8-18. 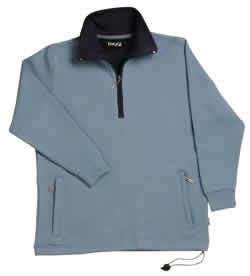 For the perfect winter t-shirt, Toggi's Ascot style is still a winner. Made from 92% cotton and 8% elastene, the Ascot is cut for ladies and features long sleeves, a round neck with a contrast inside neck panel and tonal embroidery. Available in biscuit, black, navy and raspberry, the Ascot comes in sizes 8-18 and retails for £24.99. For a slightly thicker garment that's perfect for keeping the morning chill away, Toggi has introduced the Jutland and the Rockland. The Jutland is a unisex bonded tunic half zip sweatshirt featuring a contrast colour collar, waist adjuster and zipped pockets and is available in navy/denim, aubergine/grape and denim/navy colourways. The Rockland is a ladies hooded full zip sweatshirt, made of double- sided knit bonded jersey with ribbed hem and cuffs available in contrasting colourways of black/raspberry, raspberry/sweetpea and duck egg blue/petrol blue. Both styles come in sizes 8-18 and are priced at £44.99 and £49.99 respectively. The Jutland and the Rockland join the popular Glenbrook, which was introduced earlier this year. This 92% cotton, 8% elastine knit jersey is a tailored half zip sweatshirt in a very flattering shape, with a curved hemline, raglan sleeves and a splash of contrasting colour added to the neckline. Available in petrol blue/duck egg blue, navy/denim and raspberry/sweetpea, the Glenbrook comes in sizes 8-18 and is priced £44.99. For an innovative piece of pure new wool tailoring, the Belmont is new to the collection and is a long sleeved, unisex-styled washable sweater, featuring suede elbow and shoulder panels. Available in biscuit or grape, the Belmont comes in sizes XS-XL and is priced £59.99. Teaming up with the tops is Toggi's range of ladies legwear. For a stylish lycra stretch twill jean, the Madison returns for its second season, a western style offset with Toggi rivets and leather and metal branded detail. With five-pocket detail and belt loops, the Madison comes in sizes 8-18 in navy or stone, priced at £39.99. Ever in demand, Toggi's Bedford and Moleskin jeans also return for the season. Made from Bedford cord in a five-pocket western style, the Bedford jeans come in regular (30") and long (32") fittings with a zip fly, priced £29.99. Available in navy or light olive, sizes are 8-18. The Moleskin jeans are a brushed cotton, five-pocket western style jean with a button fly. Available in sizes 8-18, they retail for £49.99. For further information and a full list of stockists, call Toggi on 0113 270 7000 or click on www.toggi.com .